Shailene Woodley wears green high top Converse “Chuck Taylor” All Stars in the film. 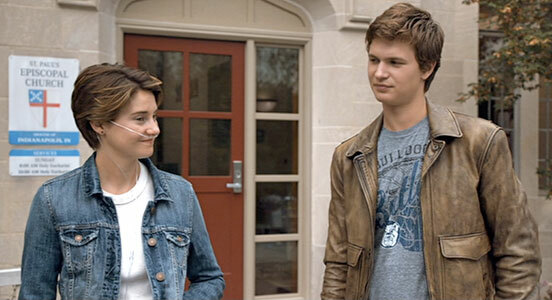 Hazel and Gus have a star-crossed romance in The Fault In Our Stars. Based on the cult-followed teen novel by John Green, The Fault in Our Stars captures audiences of all ages in an uncommon tale of young love. The circumstances are uneasy—16-year-old Hazel (Shailene Woodley) was diagnosed with cancer years prior. While a clinical trial has stabilized her condition, she’s developed two lasting side effects: weakened lungs that require an oxygen tank’s assistance, and a cynical attitude. With both of these in tow, Hazel is coerced by her mother (Laura Dern) to attend a cancer support group. Here Hazel collides, literally, with 18-year-old Gus (Ansel Elgort), who despite losing his leg to cancer, carries an infectious charm and optimism. Hazel and Gus are opposites, but that only intensifies their star-crossed romance. Hazel gets up to speak at her cancer support group meeting.. While never undermined, the cancer factor does not always overwhelm from other plot developments. It lies secondary while Hazel and Gus attempt to lead normal teen lives, hitting home a whole new message: kids with cancer are still just kids. Gus’ quirky friend Isaac (Nat Wolff) strengthens this, mourning over a breakup more so than the loss of his eyesight to cancer. Many jokes are cracked at cancer’s sake, and Gus symbolically carries an unlit cigarette with him—because by not lighting it, he eliminates its power to kill him. The film attempts to normalize their lives, but cancer still purposefully looms in the backdrop, and all details allude to a painful past. Hazel relaxing and reading a book. Tensions heighten during a trip to Amsterdam, where Gus cashes in a charity’s cancer “wish,” and travels with Hazel to meet the author of her favorite book, “An Imperial Affliction.” The book encapsulates Hazel’s personality: it’s dark and utterly pragmatic, and tells of a girl who suffers and dies from cancer. Through their travels, the audience is hit with the highs and lows: the woes of not being able to travel unhindered, paired with the wonder of a first kiss. The film is a delicate act that interweaves beauty and heartache, dreams and reality—securing an emotional ride for viewers. Hazel talking on her cell phone with Gus. Of course—this is a tough film. Setting aside the humor and light-hearted scenes, The Fault in Our Stars is a film about childhood cancer, and it’s devastating and bound to summon tears. Being of such sensitive nature, it takes an exceptional actress to play the role of Hazel, and Shailene Woodley doesn’t disappoint. The role exhibits Woodley’s acting range: she gracefully transitions from Hazel’s initial clever confidence and dark humor, to inklings of optimism and excitement under the growing influence of Gus. This change to a softer self seems effortless, and Woodley outshines the performances of all other characters—strengthening the audience’s connection to the character, and thus the movie as a whole. Gus and Hazel go on a picnic in a forest preserve. The camera focuses on Hazel's high top chucks. 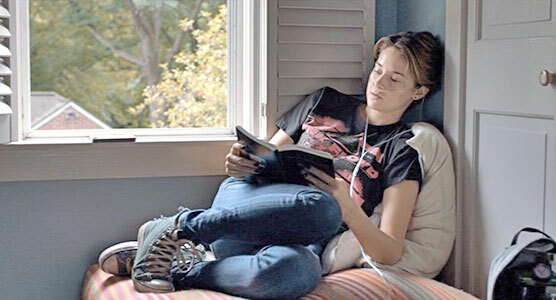 Shailene Woodley in her role as Hazel wears pine green high top chucks in many of the scenes. You quickly take notice of them. Chucks are a good fit for Hazel as they compliment her independent and cynical personality. The best chucks scene is when we see her walking across the parking lot on the way to her support group meeting. Despite the lame whiting out of the ankle patch, Hazel looks very cool in her green high top chucks. The Fault In Our Stars. (2014) Shailene Woodley, Ansel Elgort, Laura Dern, Nat Wolff, Sam Trammell, Willem Dafoe. Directed by Josh Boone. Categories: Drama, Romance.